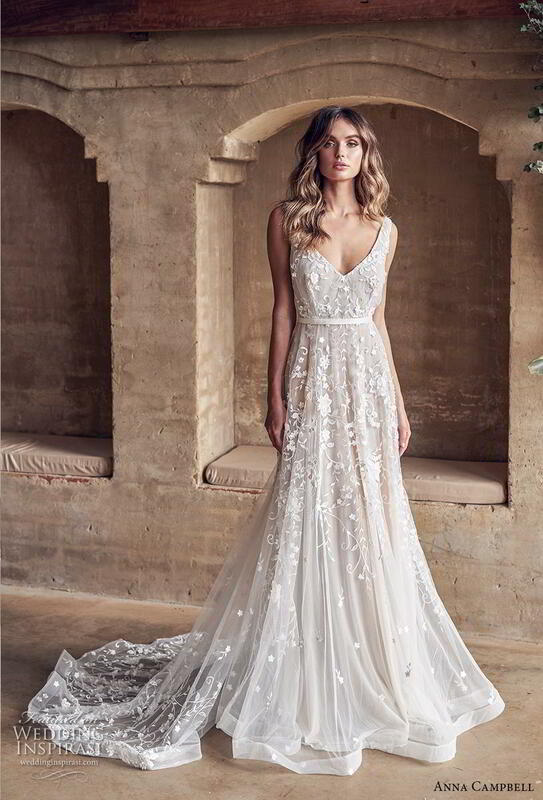 The 2019 Anna Campbell collection is launched today, and it’s filled with the most gasp-inducingly beautiful gowns ever! The 13-piece “Wanderlust” bridal collection features contemporary designs in exclusive embroidered fabrics, silks, laces, and finished with the label’s signature hand-beaded embellishments. Highlights include Paige, a vintage-inspired look adorned with 3D floral appliqués made from raw cut ribbon and silk organza, and the glamorous Wanda, which glistens with thousands of hand-sewn sequins, glass beads and pearls. “This collection was all about staying true to the incredible embellishments and unique lace adornments that have become iconic to Anna Campbell, but reinvigorating these details for a modern bride”, says designer Anna Campbell. As with all Anna Campbell collections, each gown is individually hand cut and sewn in Melbourne, Australia with the option to customize to suit each bride’s fit and style. For details, visit Anna Campell.